The Custer National Forest is scattered across Montana, North Dakota and South Dakota, but the forest headquarters are in Billings, Montana, and most hiking and camping is undertaken in the part of the forest located about an hour's drive to the south of the city. Custer is the most ecologically diverse forest in the north of the USA, renowned for its lake and stream fishing and home to mountain goats, big horn sheep, elk, muley and white-tailed deer, black bear, cougar, and moose. A popular outing from Billings is to follow the spectacular Beartooth Scenic Byway. 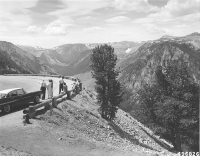 The Beartooth area is also one of the gateways to Yellowstone National Park.